FOR SALE IS A VERY NICE CARD AS YOU CAN SEE PICTURED IN THE SCAN. CARD HAS BEEN PROFESSIONALLY GRADED BY BGS.SEE SCAN & JUDGE THE CONDITION & CENTERING FOR YOURSELF.VERY NICE CARD! 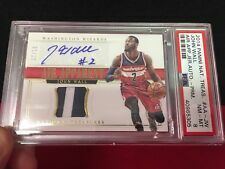 John Walls SSP Patch Auto #7/10 ~ 2014 N.T. “Air Apparent” PRM PSA 8 Near Mint!! What makes this so rare is that this card did not go through the top and bottom die cutting process, and the back of the card is blank with light ridges from the embossed foil stamping on the front. Any odd color patterns or spots in the photo are from the scanner. BRADLEY BEAL 12-13 PANINI GOLD STANDARD ROOKIE TRUE RC AUTO JERSEY SP CARD #233! CARD #233! BEAUTIFUL CLEAN, SHARP ON CARD RC AUTO! The card is in excellent condition unless otherwise described. These cards in overall is at least in NrMint condition. NO EXCEPTIONS! very nice clear auto on card IF YOU WON MY 10 AUCTIONS SO YOU WILL GET FREE SHIPPING MAKE ME AN OFFER I WILL RESPOND ALL OFFER !! PAYPAL ONLY 6$ REGISTERED shipping to all world additional shipping for 1 card is 1$ On Aug-14-10 at 05:13:28 PDT, seller added the following information: all my shipping are registered mail priority .. so is not longer like 5-14days max !!! all registered mail are for your signature .. so all buyers and seller are protected !!!! John Wall was drafted 1st overall by the Washington Wizards in 2010, and has been with them ever since. 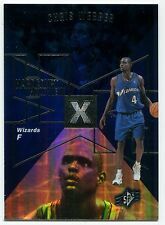 Michael Jordan 2002-03 TOPPS CHROME ZONE BUSTER REFRACTOR #ZB13, PSA 10,. Condition is Like New. Shipped with USPS First Class Package. 2018 Panini Select Gold Prizm #47 Concourse Troy Brown Jr Washington Wizards Jr.
2016-17 Tomas Satoransky 15/49 RC National Treasures Jumbo Rookie Auto Patch. Condition is Like New. Shipped with USPS First Class Package. SUPER RARE, ONLY 10 MADE! Maybe 1 of 1?. If you are a Bradley Beal collector, this is a must have card. The card is in excellent condition unless otherwise described. Beautiful card, Only 10 made! Set: 2012-13 Panini Crusade Majestic Materials. Manufacturer: Panini Group. Year: 2012. Team: Washington Wizards. LIQUIDATION OF ENTIRE COLLECTION. EVERYTHING MUST GO!!! MICHAEL JORDAN 2001-02 ~Topps Chrome Fast & Furious #FF5 "BECKETT 9.5 GEM MINT"
Michael Jordan 2003-04 Upper Deck Basketball Card Sp Game Used Legendary Fabrics. The card is in very good condition. Please see pictures for exact condition and card. Up for sale is the item in title/pictured--#'d n/a. We are sorry for any inconvenience. Factory-Sealed Unsearched Product. Great Prices. We are recognized throughout the industry for. 50,000 square-foot custom facility with over 60 people on staff. Player: Juwan Howard. Set: 1997-98 Flair Showcase Legacy Collection Row 3. Year: 1997. OR MORE IN THE CONTINENTAL USA ONLY! WE HAVE BEEN SERVING THE SPORTS CARD INDUSTRY FOR OVER 31 YEARS NOW, GIVE US A TRY! "Shadowbox Signatures" Autograph Card. 2015-16 Panini Immaculate Collection Basketball. Our service is impeccable. John Wall Washington Wizards. Serving the collector young and old for over 30 years! For sale is an awesome Bradley Beal Panini Gold Standard Metal Rookie card. The card is actually made of metal and has a very rare grade of 9.5 from BGS. Freshman Flashback jumbo swatch also included! Please see pics and thanks for looking.